Cruises from Charleston depart year-round. Charleston is one of South Carolina's most picturesque cities, with beautifully preserved architecture and an aristocratic yet gracious atmosphere. Wooden shutters and ironwork balconies embellish the tall, narrow houses, and hidden gardens hold fragrant magnolia trees. 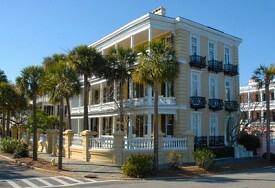 You can tour the historic quarters on a walking tour or carriage ride. Boone Hall Plantation re-creates antebellum grandeur, and Middleton Place recalls life on an 18th-century plantation. Civil War buffs can tour Fort Sumter, where local troops opened fire on April 12, 1861, and set off the War Between the States. The Port of Charleston is located 12 miles from the Charleston International Airport. Parking is $20.00 per day (rates subject to change by Port Authority). Your primary entrance gate for cruise embarkations from Charleston is Union Pier Terminal - Gate 2. Gate 2 is at the intersection of Concord and Laurens Streets. The Cruise Terminal is located within Union Pier Terminal. From I-26: Follow I-26 East into Charleston. Take Exit 219 – B (Morrison Drive & East Bay Street) and turn left at the foot of the exit ramp. Cross over King Street, then cross over Meeting Street. Once you cross over Meeting Street, you are on Morrison Drive. Stay on Morrison Drive. The street name will change from Morrison Drive to East Bay Street. Follow the green highway signs to Union Pier Terminal. You will pass a U.S. Post Office on the right. Smaller signs in brown and white with a cruise ship logo are also along the travel route to direct you to the entry gate. From East Bay Street, turn left on to Chapel Street at the traffic light. Continue to follow the green highway signs to Cruise Ship Terminal/Union Pier Terminal. Chapel Street will change name to Washington Street along the route. Turn left onto Charlotte Street and right onto Concord Street. Passengers enter Union Pier Terminal through Gate 2 at the intersection of Concord and Laurens Streets. From U.S. 17 South: Enter the Charleston area via the City of Mt. Pleasant. Follow 17-South signs to the Ravenel Bridge across the Cooper River. Cross the bridge. Take Morrison Drive / East Bay Street exit from the right lane of the bridge (first exit). Turn left on to East Bay Street from the exit ramp at the foot of the bridge. Follow the green highway signs to Union Pier Terminal. You will pass a U.S. Post Office on the right. Smaller signs in brown and white with a cruise ship logo are also along the travel route to direct you to the entry gate. From East Bay Street, turn left on to Chapel Street at the traffic light. Continue to follow the green highway signs to Cruise Ship Terminal/Union Pier Terminal. Chapel Street will change name to Washington Street along the route. Turn left onto Charlotte Street and right onto Concord Street. Passengers enter Union Pier Terminal through Gate 2 at the intersection of Concord and Laurens Streets. From U.S. 17 North: Enter the Charleston area via Highway 17- North and follow signs to Interstate 526 East. Once on 526 East, take #17 to I-26 East – towards Charleston. From I-26, take exit 219 – B (Morrison Drive & East Bay Street ramp) and turn left at the foot of the exit ramp. Morrison drive will turn into East Bay Street. Stay on Morrison Drive / East Bay Street. Follow the green highway signs to Union Pier Terminal. Smaller signs in brown and white with a cruise ship logo are also along the travel route to direct you to the entry gate. You will pass a U.S. Post Office on the right. From East Bay Street, turn left on to Chapel Street at the traffic light. Continue to follow the green highway signs to Cruise Ship Terminal/Union Pier Terminal. Chapel Street will change name to Washington Street along the route. Turn left onto Charlotte Street and right onto Concord Street. Passengers enter Union Pier Terminal through Gate 2 at the intersection of Concord and Laurens Streets.